Why blog? I have been asking myself this question. It was recently suggested to me by someone I deeply respect and who cares about my inner creative progress, that I blog. For one, it runs in the family, really. My mother had her own radio show in the Maritimes that was successful and was continuously getting herself into print with varying submissions over the years, a propensity I admire about her. My daughter is a blogger and a very good one at that. I am aware, after a bit of a struggle that it is important in many ways. 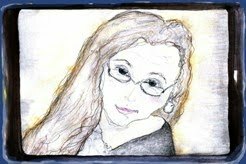 For one, while I have published two books, I still do not feel as though I have hit my stride in terms of writing and this is a good way to loosen up, find my voice, much as the artist sketches before the preliminary canvas. I have written for the web, ghost written for others, and too often rescued butchered text that was part of my business to bring to redemption. This however, is sole voce, albeit sotto voce and a prelude, a search, a means if you will for finding my stride and searching for an inner beat that is a creative loosening up. Perhaps it is interesting to you dear reader, or perhaps not, I will leave it to you to decide. If there is more to this question I have not yet come upon it. Whilst contemplating such profound thoughts such as, I am not my brother’s keeper and varying permutations of I am the captain of my soul and the master of my destiny, with a little hum, as it were - one has to, in the meanwhile, nurture oneself. I have seized the peace of the day and brought out my pasta machine which has not seen the sunlight in years. This meant, of course, handmade ravioli. One hour later I had managed to produce a presentable ricotta-filled ravioli with an olive and tomato sauce which was delicious but not before muttering rabidly that surely one gets better at this and in Italia what exactly is the methodology? Suddenly, as if the fates were, in a rare moment, granting my every wish, I saw an Italian cook make ravioli on television with the identical machine I had. She just whipped the pasta through the machine but not before I picked up valuable tips with flour, tea towels, widths, and what not. Tutti a tavola a mangare! If the spirit is flagging there is always handmade ravioli. Maybe not quite ready for the next book but definitely uplifting, especially when shared. I have a strong response to this. I am reminded of a fairy tale that was in a book that came from my father to me when I was a child. It was a story where angels came to test humans to see if their hearts were true. When the humans did not show kindness, were consumed with self importance, and were dishonest, the moral of the tale is that blessings left and so did the angels. Like this speaker I am feeling that radical change on many levels is on order for my life. It goes beyond shopping patterns. This feels like honouring and loving my spirit. Sometimes change that is all a part of the walk along the red road comes in this manner. In doing so I honour my soul's calling for movement. And How Is This Profitable For Business? Okay. So I phoned them and after some deliberation and security checks my money is finally being returned to me but not after deducting $3.35. This is the “handling fee”. Yup. Great. This is all new. I have never experienced this before. You got your fee from me folks and that is deducted but a) I won’t purchase like this again b) I took up time with your employee to retrieve my money which cost you c) the paper work now to send me the money and issue the cheque is involving how many people? and at what cost? Yeah, so really this fee is more costly to enact and more inefficient in terms of the business which is now permanently minus one disgruntled shopper. I would cancel my card except that I am held hostage rurally and if I need a new appliance this is the way to go. However I will be exploring options with that as well. This week I discovered the reason for a puzzle I was having with a credit card I owned where a catalogue company was charging me for overpaying their bill. I kept overpaying so that they would stop sending me bills saying I owed them when it was, I have lately discovered, their policy to charge for the "inconvenience" of this. Charging me for having a credit? This is legal? Today I returned an item on the same credit card. I was only given a credit by the retail outlet. I began to worry that this company would penalize me for this too and I decided I wanted my money back. I phoned them and they told me that the credit was not showing up on their screens and to try again in 5 days. I will. I have decided I am not buying from this famous chain any more. I am altering my purchasing pattern. I have cancelled all my catalogues. I am sure there must be many shoppers out there coming to the same conclusion. It more than a matter of principle. Do I not want transactions that are straight forward without delays and hidden charges?